Web Special for Ordering Soon! 1/2 Price!! — Accurate Performance Ratings and Selections that work at EVERY track and at EVERY Class Level! Now Every Horseplayer can have is his/her hot little hands the most accurate Comprehensive Performance Ratings in the Business — Ratings that will provide you with an accurate look at the REAL contenders in a given race. 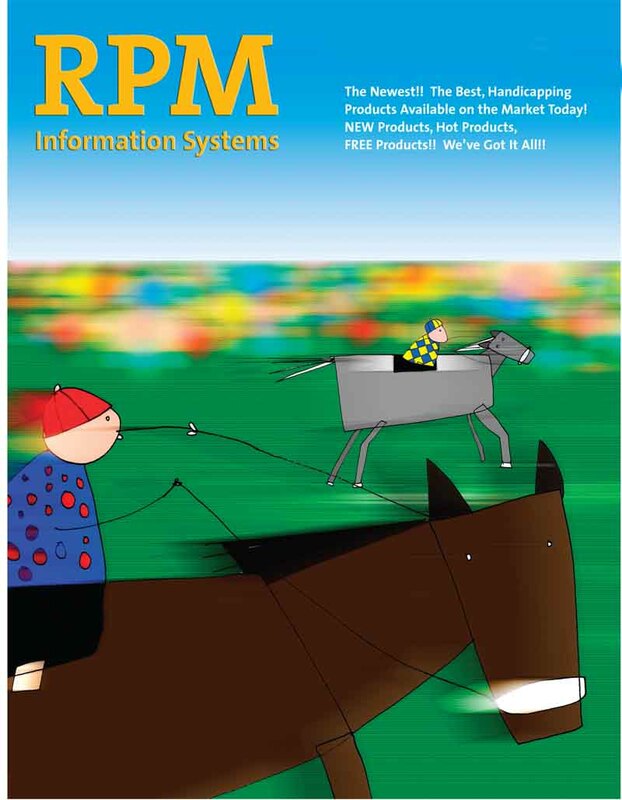 A Software program that also provides ‘Best Bets’ when the conditions look RIGHT for a win or Exotic wager. You can now approach the races with confidence because you know the ratings generated by Thoro-Rate are accurate and often produce BIG prices and BIG PAYING Exotics. THORO-RATE PRO produces extremely sophisticated performance ratings, Ratings that measure every aspect of previous performance — and then PROJECT those Ratings into each horse’s likely PERFORMANCE today. THORO-RATE Pro did not give Hengist a big edge, just a one point advantage, but a price horse that has any edge in the ratings is always worth a wager with this program. Hengist cruised to a $53.80 victory. THORO-RATE didn’t leave much doubt here as to which horses owned a huge edge over the others. Both parts of the #1 Entry scored big, a full 11 and 10 points better than the third-rated horse. And, they finished 1-2, and look at the prices — $11.20 to win, $11.00 to place!! Tangelo had a 2-point edge over Three Blondes and got the job done at $12.20 with that pair returning a darned decent $54 Exacta for a rather obvious play. What Tom is doing is pretty much what I have been doing for decades, only the ratings my Thoro-Rate provide take into many other factors as well. As you can see from the above, a good performance rating must take into consideration all aspects of ‘pace’. You cannot judge a horse’s performance by final time, or early fractions only. My pace figures, like Tom’s, are honed to a fine edge by comparing a horse’s fractions to the average par time for that class of animal. This formulation can provide the handicapper with an enormous edge. Comparing a horse’s fractions to the par times for that level of competition can uncover some amazing plays. Let’s say average time for the class level at the half-mile call is 45.4, but this horse is running 45.1 or faster fairly consistently. Only a tiny % of the players have this knowledge, but this horse may very well have that ‘hidden’ pace edge that spells BIG win and exotic mutuels. With this technology,you will often spot a horse who is likely to reach the 1/2 or 3/4 pole much quicker than is obvious from looking only at the past performances, which is all that most horseplayers do. You will, therefore, possess knowledge that 95% of the players are ignorant of. OK, so if you have in your possession the above formula for comprehensive pace/performance ratings, you are going to be many, many steps ahead of the rest of the crowd. But what if you had all that going for you, plus a whole lot more. Well, with Thoro-Rate Pro, you get just that. Thoro-Rate numbers also include ‘weighted’ ratings for every trainer and jockey, as well as weighted ratings for every jockey/trainer ‘team’. In addition, the CLASS formula Thoro-Rate uses cuts through the ‘rough’ of all these dozens of sometimes very weird Race Conditions written by the Racing Secretary. Thoro-Rate judges each horse’s class ability based on his/her performance in recent races at various class levels and then ‘projects’ that runner’s class adeptness for today’s race. Thoro-Rate also contains a great tool that I call ‘Momentum’. This devise measures the amount of ‘energy’, if you will, a horse is bringing into today’s race. To put it simply, there are many factors that determine if a horse is improving going into today’s race, and the ‘Momentum’ module takes all of those into consideration, and then awards ratings based on likely improvement. This factor (the next-to-last column on the software screen) alone is great at picking winners and contenders. First off note that when you look at the TOTAL column, and try to figure out how in the heck all those other columns add up to the total, well, don’t worry, they don’t. The TOTAL score is calculated internally based on weightings of the other columns but, rest assured, you can rely on these numbers. You will also not that the ‘RATE’ columns are either 12, or 0. These columns comprise the actual ‘raw’ fractions and final times. 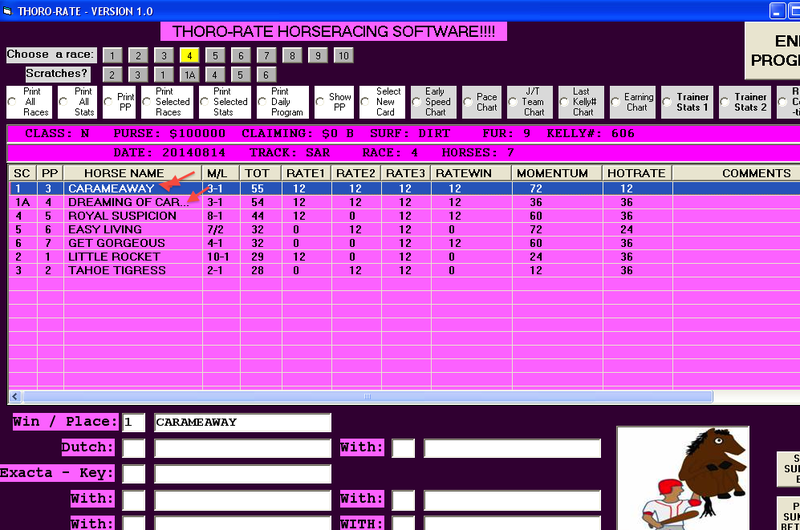 Thoro-Rate evaluates each horse’s chances based on these fractions. If the fractions indicate that a horse has even a ghost of a chance to win today, a 12 will be awarded. If the program figures one or more of the fractions is so out of line that the horse has little chance, a 0 will be awarded. Horses with one or more zeros have a very slim chance to win. The real ‘muscle’ of the program is in the final two columns, Momentum and HotRate. Momentum was explained above. HotRate is the column where the overall performance ratings, including everything we explained above, are figured and then factored in with the rest of the data to produce the TOTAL ‘weighted’ rating. The program selections, if any, will be based on the TOTAL column. First of all, races to avoid are those which have three or more zero scores in the TOTAL column in fields of 8 horses or less and four or more zero scores in fields of 9 or more. These are races where there are too many unshowns, first-timers, foreign horses, etc., and tend to be more unpredictable than races where most of the horses have scores in the TOTAL column. Any top scorer who has at least a 1-point edge when you sort the TOTAL column is worth a look. The bigger the edge the top scoring horse has, the likelier that runner is to hit the board (run 1st, 2nd or 3rd). We recommend a win and place wager on the top scorer if the morning line is between 2/1 and 5/1. When the morning line is higher than 5/1, an across the board wager is recommended with more money being placed on the place and the show than on the win. You will note that the program also makes Exacta suggestions. In the above example you will see that Tangelo is recommended as an Exacta ‘key’ — it suggests putting her on top of four other horses, the 1, 5, 6 and 8 in the Exacta. Now, if the horse is at 5/1 or higher and the field is comprised of at least 8 horses, we would further suggest that you reverse that wager and put the other four horses on top of the key horse in the Exacta as well. On occasion the program will also recommend a ‘Dutch’ wager using two horses. This simply means that you would play both horses to win assuming both are 2/1 or higher on the morning line. In races where several horses are tied or just a few points separate the 1st horse from the next three or four horses, a risky but often very profitable wager is to box (up to 5 horses in fields of 9 or more horses) in the Trifecta and Superfecta. You will, of course experience runouts using this method, but we have recorded many Trifecta payoffs in the $500+ range and Superfecta payoffs in the $1000+ range using this technique. Overall, Thoro-Rate has the highest win/place % in claiming races up to $40,000. Also, in Allowance sprint races for males, the win/place rate is very high for the top scorer, though the average mutuels are lower than in claiming races. 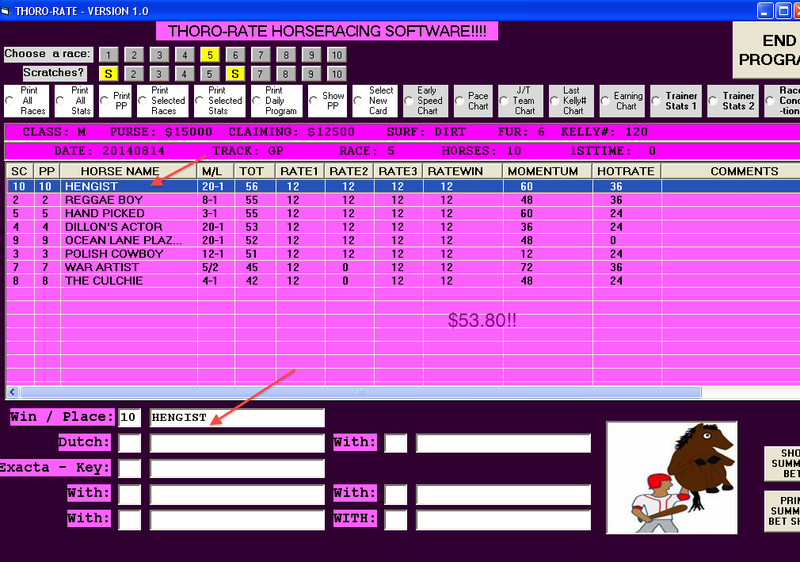 With Thoro-Rate, you have a dependable source of performance ratings and wagering suggestions. The great thing about Thoro-Rate is that it will pinpoint contenders that you never would have isolated on your own. Thoro-Rate Pro is very reasonable priced at just $97 …. BUT, if you order before September 10, you can get Thoro-Rate for less than half-price — just $47.77 — this is not a deal you want to pass up!! !